After recieving MsDebbies post this morning I thought I should take a few pictures of this step stool and enter the kitchen challenge. The step stool was made on the request of MBH as she is sligtly vertically challenged and couldn’t reach the upper cabinets in the kitchen. Since then it has become more of a utilty stool used mostly for painting. The plan was published on the Home Hardware site as a free download. I made it out of pine scraps that I had around the shop. 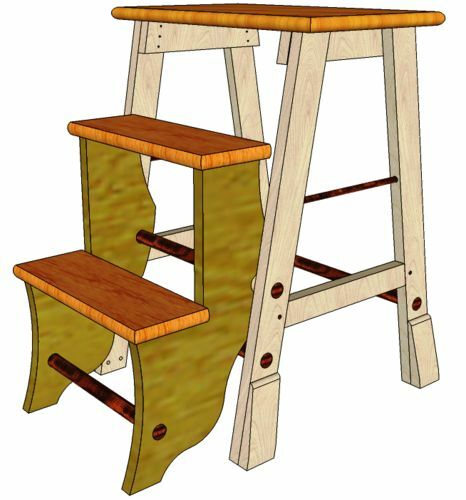 The stool was actually made as a joke but has turned out to be quite handy. Great job, I like the design!! Nice step stool. I really like the design. I wish your blog shared some details how to build one. Well done, & a very good use of material from your scrap bin.